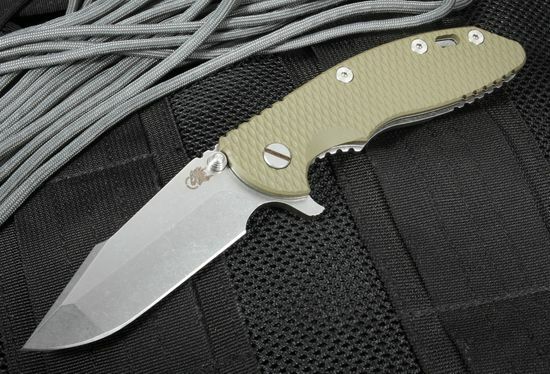 By combining the spine of a harpoon blade profile with the edge and grinds of the Spanto blade, Rick Hinderer creates the XM-18 3.5" Harpoon Spanto Flipper - OD Green, a knife designed for heavy use in tactical, combat, or military applications. The 3.5-inch CPM 20VN stainless steel blade is stone-washed to provide extra durability and an extremely attractive appearance. The 20CN steel is well known for it's edge retention and cutting ability. 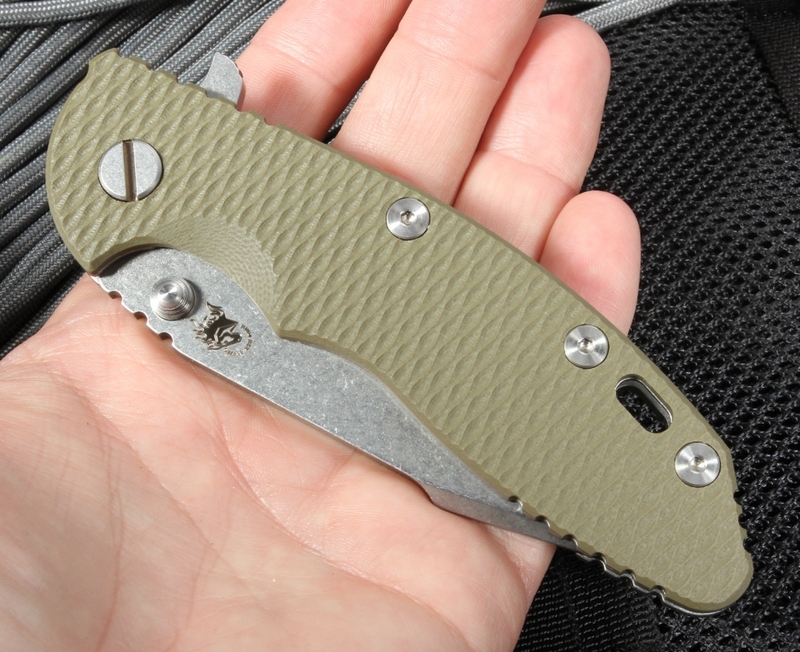 The machined aerospace-grade titanium and textured OD Green G-10 make up the 4.75-inch handle, extremely durable. The OD Green color of the handle blends excellently with other military, tactical, or survival gear. One-handed opening is provided by dual thumb studs and a flipper, and the flipper also functions as finger guard when the blade is open. Jimping on both the blade spine spine offer exceptional grip, especially when the knife is wet from rain or sweat. A solid frame lock design provides the XM-18 Spanto with smooth but sturdy opening and closing, and securely locks the blade with beefy titanium. The Harpon Spanto folding knife features a titanium pocket clip mountable for either tip-up or tip-down pocket carry. The lanyard hole in the handle allows you to tie up a paracord lanyard and customize with your favorite bead. With an overall weight of 5.5 ounces, the Spanto is hefty and solid enough for serious use, but in a in a build that is decidedly on-road, off-road ready.